Some years ago our son had an earache, and on his way home from work he stopped to buy something that would give him some relief. He picked up a brand that included natural ingredients, and one of them was mullein flower. 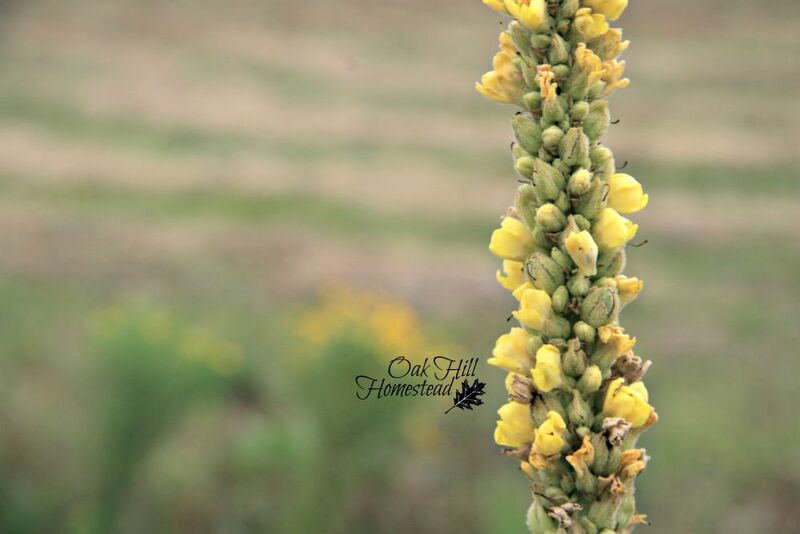 Mullein flowers have antiseptic, infection-fighting and pain-relieving properties. 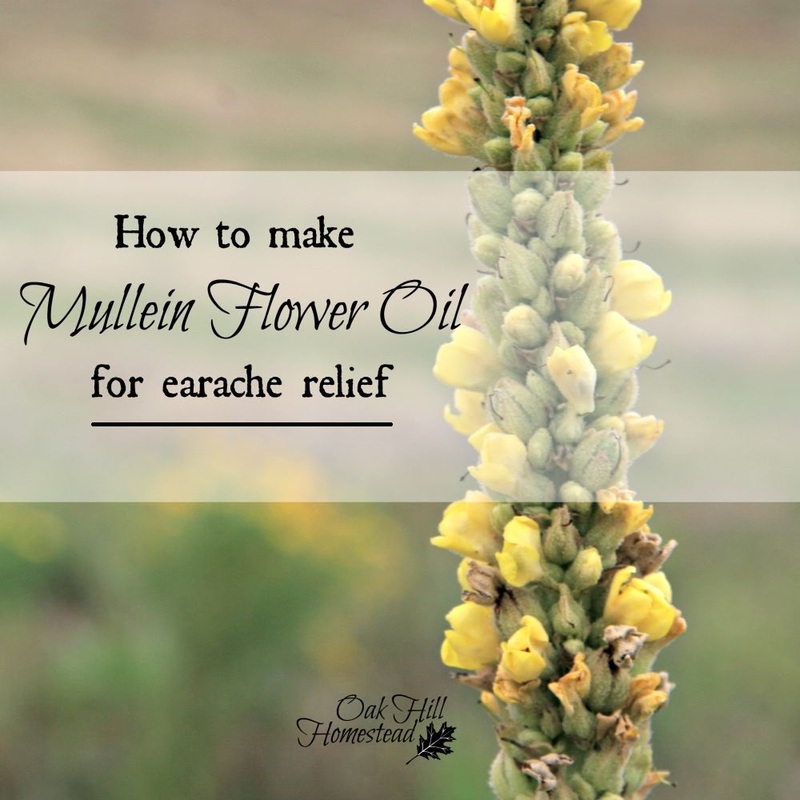 Oil infused with mullein flowers have long been used to relieve the pain of earaches, and it's easy to make your own. A young mullein plant in early spring. Mullein is a "weed" that's easy to spot in the wild. It's a biennial, taking two years to reach maturity. The first year plant has soft and fuzzy leaves growing in a rosette; in the summer of the second year the plant sends up a tall spike with yellow flowers. This flower spike is easy to spot in fields and along roadsides. If you are fortunate enough to find some two-year-old mullein plants in a place where you can forage - don't use plant material that grows along the road, under power lines or in other areas where herbicides might have been sprayed - you'll probably find that these flower spikes only offer a few flowers every day. If you find a good-sized patch you can harvest some from each of the plants; otherwise you might have to come back a few times to pick enough flowers. Please be ethical in your harvesting: don't take all the plant material, leave enough for the bees and to make seeds for next year. A good rule of thumb is to harvest no more than 30% of any plant material. Mullein grows nearly everywhere, but if you can't find any you can order dried flowers from Mountain Rose Herbs or from Amazon (affiliate link). 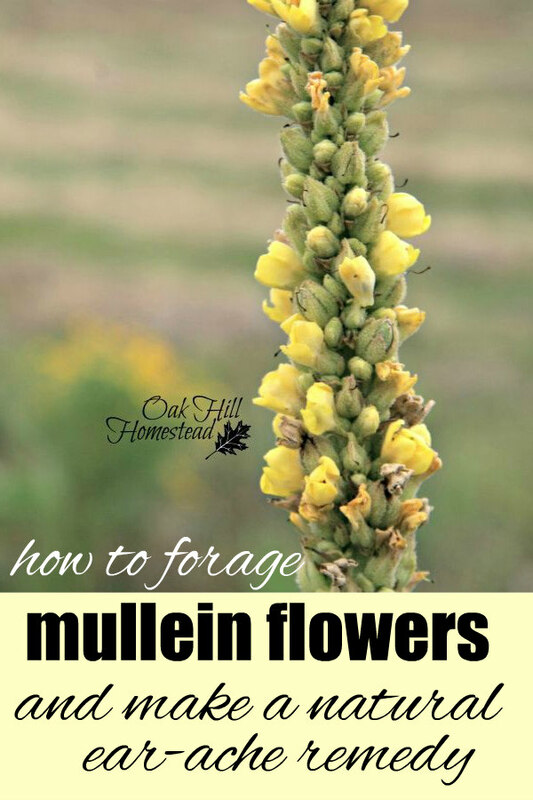 If you want to plant your own mullein patch, you can gather the tiny seeds while you're foraging for flowers or you can buy seeds from Amazon (affiliate link). After harvesting, I like to let my flowers set for a couple of hours before preparing the oil infusion. This helps to reduce the moisture in the flowers which also reduces the possibility of mold down the road. 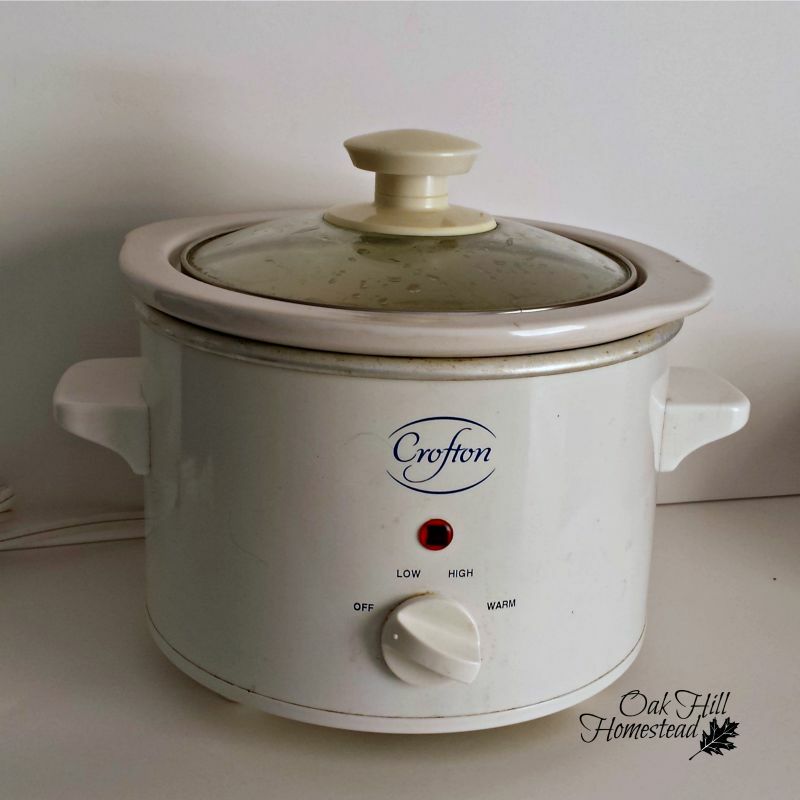 I use a small crockpot like this (affiliate link) to infuse oils. Mine has a "warm" setting that's perfect. The ratio of plant to oil that I use is 1:2. One cup of flowers would need two cups of oil, or 1/2 cup of flowers would be infused in one cup of oil. You can read about measuring in parts here. I set the little crockpot on the warm setting and leave the lid off. Letting the oil warm for several hours helps to draw the medicinal properties out of the flowers. When finished - and there isn't a rule about how many hours you need to let the flowers infuse in the oil, just do it for as long as is practical for you - strain out the flowers from the oil. I like to do this right away while the oil is thin, but the oil is hot so be careful if you do this. I strain it through a wire strainer first to get out the larger material, and then pour it through muslin into another jar. The muslin will catch smaller particles. I let this cool and then squeeze the muslin to get out all of the oil I can. Use a brown glass bottle to store the mullein flower oil and store it in a dark cupboard. Oh, don't forget to label it. Infusions look alike once they are strained, and they can be hard to tell apart. Don't ask me how I know that. 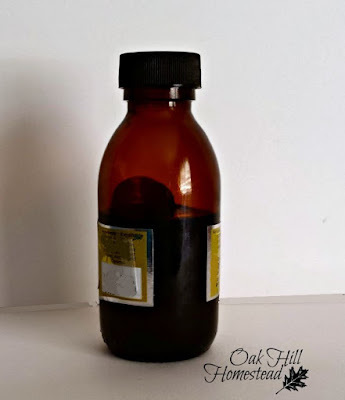 When needed, it's easy to use this oil to relieve the pain of an earache. Apply a few drops into the ear canal with a dropper and follow with a bit of cotton to help keep the liquid inside for as long as possible. I am not a doctor. You are responsible for your family's and your own health. If there is discharge from the ear, please see a doctor. Great tutorial, Kathi. If you didn't use a crock pot, would you use the stove top or the oven? What about on a warming wrack on a woodstove? I'm guessing you don't want the oil hot enough to 'cook' the flowers, just warm them to release their properties. Is this the same technique you would use for comfrey and cayenne? Thanks for the information. Fern, I've used the stove in the past, in a double-boiler sort of way. I put the plant material and oil in a jar and then set the jar in a pan of water. Use low heat. You're right, you just want to warm the oil, so be careful not to let it get too hot. The warming rack on the woodstove might work well too, depending on how hot it gets. Yes, I do the same with cayenne, comfrey, plantain and other herbs and plants. The methods are interchangeable: crockpot, stovetop, or leaving the jar in a sunny windowsill for several weeks. I have used garlic oil with good success for ear aches but hadn't thought to add Mullein flower. Really great tutorial, now I need to go pick some Mullein flowers. Thanks! You're welcome, Connie. Thank you for stopping by. Wow, this is great information, Kathi! Thank you so much. You're welcome, Mary, I'm glad it was helpful. Hi Kate - mullein has a range of medicinal properties and is a great plant to have in your garden. The leaves are made into tea for respiratory problems as well (colds, flu and other ailments). Thank you for visiting all the way from the UK! I love good quality herbal posts and you have written one here. Pinning this one as well. Thanks for sharing this with us on the Homestead Blog Hop. Thank you, Gregg. Don't you love finding medicine in the fields around you? What valuable information! It's amazing what nature provides us in the way of medicine. Thank you, Daisy. We are blessed to have both medicine and food growing wild. Great tutorial! I'll be on the lookout for mullein now! The whole mullein plant is useful, so it's a good plant to locate. I scattered seeds closer to the house last year so I wouldn't have to walk so far to the big patch out back. I hope you can find some, Lisa. I'm not sure if we have Mullein flowers in the UK but I think we might - I'm going to have a look in our local area. I really enjoyed this post as I love learning more about natural remedies. Pinned to a group board so others can find it too! Thank you for sharing with us at Hearth and Soul, Kathi. I hope you're able to find some, April. Wikipedia says "Verbascum thapsus. L. Verbascum thapsus (great mullein or common mullein) is a species of mullein native to Europe, northern Africa, and Asia, and introduced in the Americas and Australia" so it's out there somewhere! 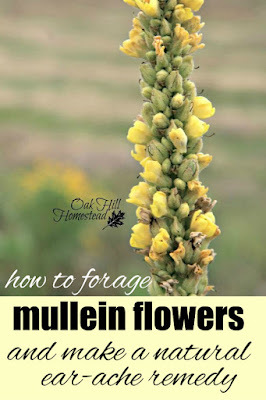 Great article, I will look to find some Mullein flowers here, thanks for shairng with Hearth and soul blog hop. I am glad you posted this on our link up! My daughter in law will love this post as a new mother of 2 little ones. Thanks for sharing on Country Fair Blog Party, and i can not wait to see what else you are up to in October! Jam, I hope your daughter in law doesn't have a lot of opportunities to use this. I always feel so bad for little ones with ear infections. You're welcome! 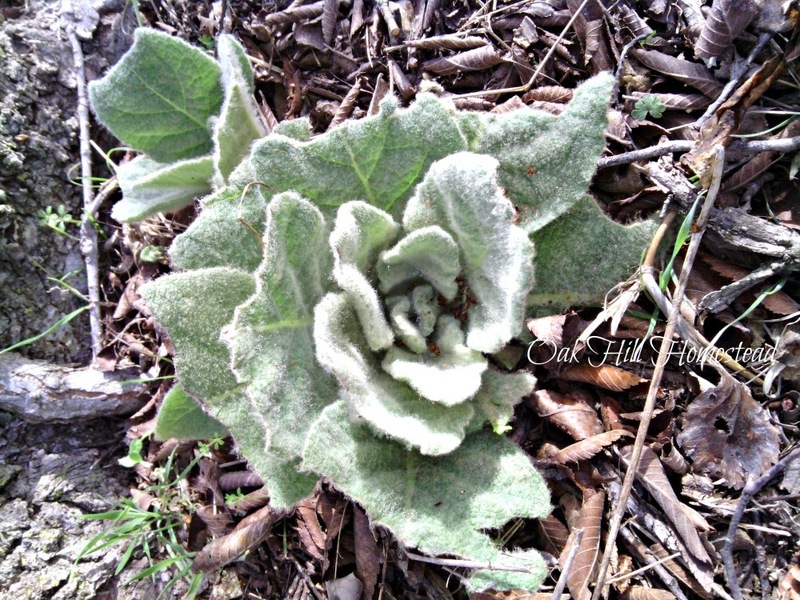 For more about mullein and what it can tell you, see my post Wooly Mullein. Kathi, can you tell me what the shelf life would be approximately? With just the Mullein and with the garlic added? This isn't a scientific answer, but I believe that the Lord gave us these herbal remedies, and that a batch will last until the next harvest. Store in a cool, dry place out of sunlight. Thanks for sharing your recipe. I've grown mullein for years and I have shared with my sister in law who still has small children. Bless you for sharing, Nikki. I'm sure she appreciates it. The leaves are a good respiratory remedy as well, as I'm sure you know. I've only tried the crockpot method once before for fresh ginger oil but I think it was just too big because even on warm it kept boiling. But I do have a small crockpot like you pictured and a bit of harvested mullien so will add this to my list! Also, sorry if you get two comments from me I can't seem to remember how to comment from my wordpress account! I hope your small crockpot works better for you. Larger ones do seem to get hotter.